View across the upper part of the landslide at 12:37 p.m. on July 11, 2009, about forty minutes after the initial movement. A section of the canal has been completely destroyed by upslope enlargement of the landslide. Photograph by Dustin Auman. 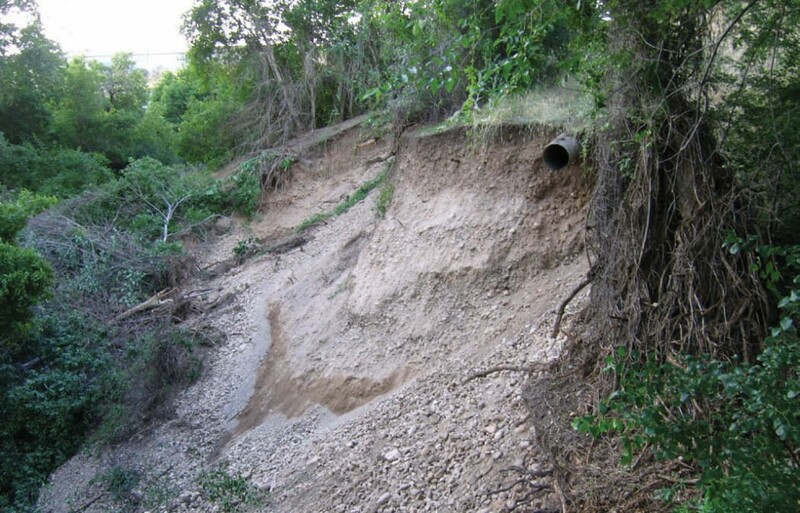 Shortly before noon on July 11, 2009, a landslide occurred on the lower part of the Logan bluff, directly south of Utah State University and U.S. Hwy. 89, destroying a house and killing three people—a mother and her two children. The residents were in the process of evacuating the house they rented along the north side of Canyon Road on the advice of their landlord, and were likely gathering some of their belongings when the house collapsed and was partly overridden by landslide debris. 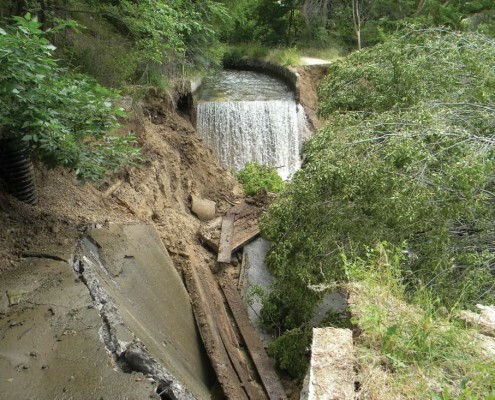 Based on eyewitness accounts and photographs, the landslide initially occurred between the bottom of the bluff and the Logan Northern Canal farther up the slope, rapidly destroying the access road along the south edge of the canal and the southern part of the canal, which caused some of the water in the canal to spill directly onto the top of the slide. Within about forty minutes of the initial failure, upslope enlargement of the landslide completely destroyed the remainder of the canal. Canal water cascaded onto the east side of the landslide causing flooding and sedimentation, partly burying a house directly to the east of the collapsed house. 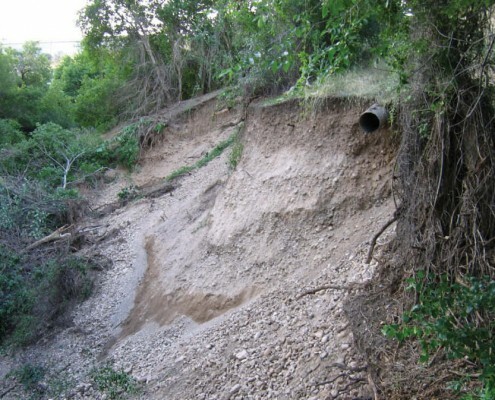 The July 11 landslide is the second destructive landslide on the bluff in four years. A landslide in September 2005, just a short distance to the east, occurred on the slope directly above the canal, temporarily blocking flow in the canal, and sending debris and water into a house below the canal. The timing of both landslides in the second half of the year is not typical for landslides in northern Utah, which usually occur in the spring.